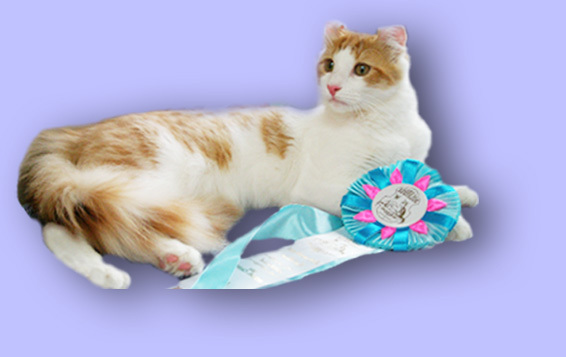 American Curl cats, CURLAND cattery, WELCOME ! Rolandus (RUI) reg. N 776. 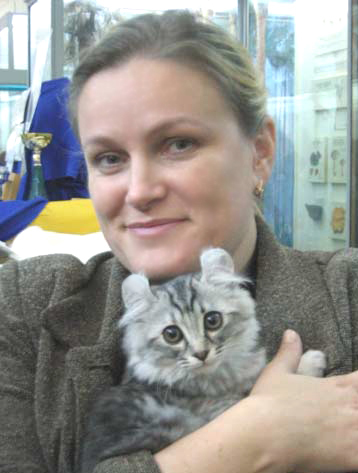 American Curl cattery "Curland" , breeder / owner Anna Naumenko , Kyiv, Ukraine. Nice to see you at my virtual home!!! On the beginning of summer 2005 we try to find kitten. American Curl - breed, which at once has interested me very much! Unique character, very tender, gentle, playful and inquisitive, they wants to be near the owner. It was fantastic, that I found such cat! And when I only have seen this miracle - expressive eyes, curled ears, silky wool, a fluffy tail and gentle peach color... And when Lucky-Cleo has easy gone on hands and mrrrr...It is FATE!. Lucky, our first American Curl girl , very graceful, cheerful and clever, as a dog and very sociable. For a short time she became our superfavourite. Lucky - a cat with a human face and almost human behaviour..
At first, we take part at the cat shows of our club "Rolandus" (RUI - Rolandus Union Inernational) , then, after the year, 07.10.06 registered our own American Curl cattery , wich called "Curland" - The Lands of Curls :) . American Curl cats - the best cats breed of the world ! ! ! "American curl is a very special breed. First of all people see only their strange ears. Some find they look sweet, some think they look weird. Most people fall in love with curls because of their charming baby faces. But only after they start living together they find the best part: extremely affectionate personality of American curl." Curland Mira Belle, ACL, b, chocolate. In breeding of our American Curl cattery, we likes different colors and LH and SH variants of a hair. Our cats are treated with love and respect, like one of our family members. Forages of a premium-class, meat, vitamins, additives, toys, a game complex - all it allows to grow up healthy in every respect posterity. We have a kittens for soul, and for exhibition. You can receive consultation, and also reserve the liked kitten. Our american curl kittens are given to the new home after 3 month with vetdocument and transfer of individual registration. Naumenko Anna, American Curl cattery "Curland", Kyiv. Welcome ! American Curl cattery "CURLAND", Ukraine, Kyiv. American Curl photo. American Curl Kittens for sale. American Curl breeder.